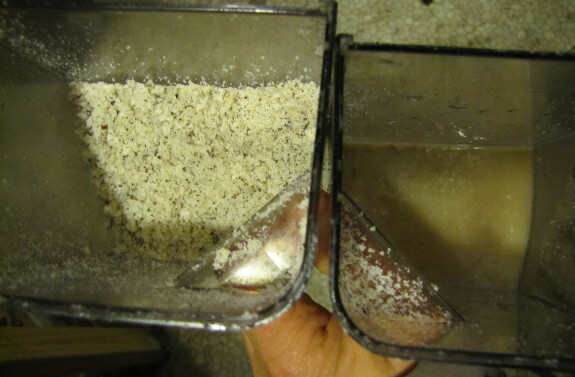 We made some progress with our second coconut flour experiment, but we haven't figured it all the way out yet. 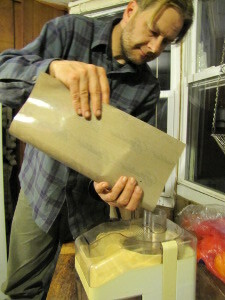 Mark had watched a youtube video that showed how to extract coconut butter by drying the meat and passing it through a juicer, so we started our experiment by whirring the coconut meat up in the food processor, then letting it dry out in the food dehydrator for about eight hours. I suspect we made a mistake when we turned off the dehydrator before supper and didn't get to the juicing stage until a couple of hours later. In retrospect, I think the dehydrating step wasn't meant to dry out the coconut so much as warm it so the oils would flow better. Perhaps that's why the juicer was only able to extract a moderate amount of oil from the coconut meat. I didn't think the de-juiced coconut meat was fine enough to bake with, so I passed the fragments through the MagicMill on its most coarse setting. Unfortunately, there were still enough oils left in the meat that the coconut flour gunked up the machine, just like last time. 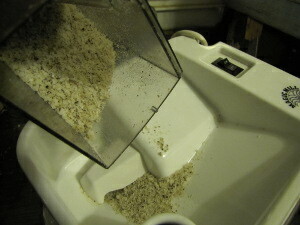 Clearly, we need to figure out the extracting step better before we put the remains through the mill. I can tell we're making progress, though. 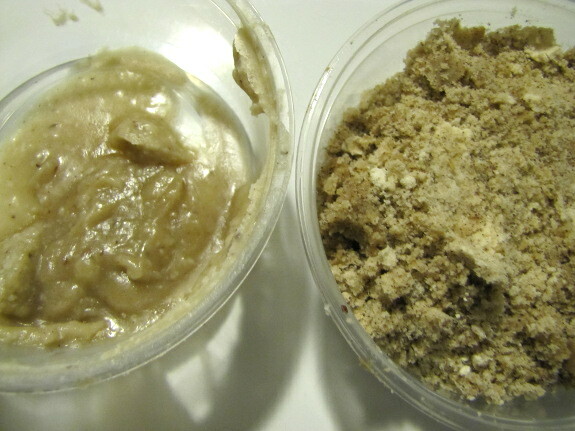 Look --- coconut butter separated from something vaguely resembling coconut flour! Our chicken waterer is perfect for broody hens since it won't spill and dirty the nest.